The search for a man who disappeared in 2004 led an investigator to a San Diego park before the trail went cold. More than a decade after the mystery started, new tips are reviving the case. SAN DIEGO (KGTV) - The search for a man who disappeared in 2004 led an investigator to a San Diego park before the trail went cold. More than a decade after the mystery started, new tips are reviving the case. Daniel Yuen was 16-years-old when he ran away from a controversial boarding school in the San Bernardino mountains. The school has since shut down. “He, in a sense, vanished,” said private investigator Keith Raymond. Raymond, a retired Los Angeles Police officer, is haunted by the situation. For decades he has tracked down missing children, 300 in all. Daniel Yuen is more than just an open case. "I don't have a word for it, other than it's discouraging,” Raymond said. In the months after Yuen first disappeared, Raymond and Yuen’s family tracked him to Hilltop Park in Rancho Penasquitos. Search dogs found Yuen’s scent and witnesses reported seeing him. For 14 years, there were no further tips. That changed last month. Raymond received a message on an old business phone line. "I listen to this entire message. And it's eerie. 'Hey, Daniel Yuen is alive, he's living in the same area,'" Raymond said. "'Daniel does not want contact; he does not want to be found.'" Raymond returned to the park and spoke with a witness who said Yuen had been there 45 minutes earlier. With the help of an age-progressed photo, Raymond is trying to find others who might recognize Yuen at age 31. "Every phone call you think, is it him. Every doorbell you hope, it's him. It’s just heartbreaking,” said Yuen’s sister. 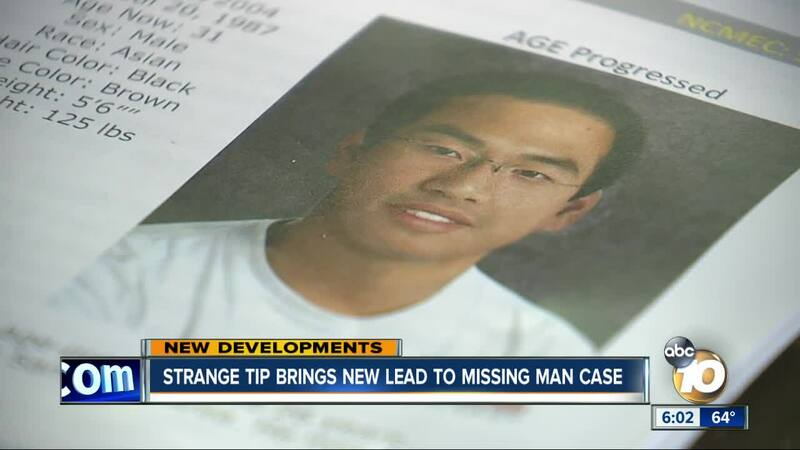 10News talked with Yuen’s parents and sister in New Jersey. They said the past 16 years have been agonizing. "Tell him that we love him very much, we cannot pass the days without thinking about him,” said Yuen’s mother. Raymond told 10News Yuen is not in any trouble, his family just wants to know he’s okay. Anyone with information is encouraged to call the National Center for Missing and Exploited Children at 1-800-THE-LOST or contact the family online .